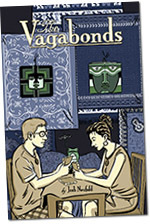 My new solo book, The Vagabonds, will be debuting the week of June 16! More details, as well as cover images and a sample story, can be found here. On Wednesday, June 18, from 5 – 8 PM, I will be joining cartoonists Nick Bertozzi (Rubber Necker) and Dean Haspiel (Aim to Dazzle) at Jim Hanley’s, 4 West 33rd Street, NYC, where we will sign comics and entertain visitors with our poor attempts at humor. I will be but one of the hundreds of comics creators at the 2nd Annual MoCCA Art Festival on Sunday, June 22, from 11:00am to 7:00pm. MoCCA — which offers fans, professionals and the general public an ideal opportunity to view and purchase a wide range of works from independent, alternative, and up-and-coming comic and cartoon artists — will be held at the historic Puck Building (293 Lafayette Street at Houston, New York City). The event is open to the public. Suggested minimum donation is $5, with all proceeds going to support the nonprofit Museum of Comic and Cartoon Art. Other artists scheduled to participate include Bill Plympton (Mutant Aliens, Hair High), Craig Thompson (Goodbye, Chunky Rice), Howard Cruse (Stuck Rubber Baby), James Kochalka (Pinky & Stinky, Monkey vs. Robot), Jeff Smith (Bone), Patrick McDonnell (Mutts), Peter Kuper (SPY vs. SPY, World War 3 Illustrated), and Phoebe Gloeckner (The Diary of a Teenage Girl). This year’s Special Guest Honoree will be Art Spiegelman (RAW, Maus, Little Lit). More details can be found here.